In December 2009, Tristina Elmes owed more money than she could pay in taxes and found herself in tax court. The IRS wanted to collect as much as they could as quickly as possible. During an IRS summons, Elmes chose to plead the Fifth Amendment because she didn’t trust the IRS in its fishing expedition. The IRS took her pleading back to court, which in turn evaluated each question she had refused to answer. Only two questions were found to be potentially incriminating enough that Elmes could avoid answering them. She was required to answer all the others. In a summons interview, witnesses may assert their Fifth Amendment rights only in response to questions where the answers may incriminate them. Fact-gathering questions such as “What is your name?” would not be incriminating enough to justify not answering. On May 21, 2013, Lois Lerner, head of the IRS Exempt Organizations division, was summoned before the House Oversight Committee to explain why the IRS discriminated against conservative and religious nonprofits. The IRS had already admitted to the discrimination. Our representatives were simply trying to gather more information about what happened. At this committee meeting and under oath, Lerner read a prepared statement where she claimed she had done nothing wrong. She then cited her Fifth Amendment rights to justify not answering any questions. 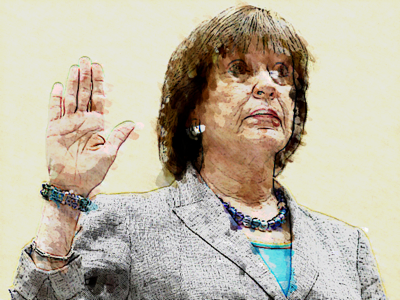 If, as Lerner claimed, she had done nothing wrong, there is no possible way she could incriminate herself. Because her claim was made under oath, the law recognizes that no possible question could incriminate her. This makes all questions permissible to ask and Lerner required to answer them. Thus her opening statement made pleading the Fifth a legal impossibility. Additionally, if Lerner had the right to plead the Fifth, she only had the right to do so one question at a time, the same as Elmes. She was not allowed to avoid any and all inquiry by pleading the Fifth. Neither was she allowed to claim she was wary of a witch hunt and therefore didn’t want to answer any questions. Despite these facts, the committee recognized her pleading and allowed her to leave the trial without answering further questions. This legal incident provoked much debate. The fact is that public employees may have greater Fifth Amendment rights than financial advisors. Created after the stock market crash of 1929, the federal Securities and Exchange Commission (SEC) regulates financial corporations. They have been charged with ensuring that nothing inappropriate occurs in the world of securities exchanges. As a result, they have created hundreds of rules of compliance for firms dealing with securities. These rules have not prevented the Enron scandal, Bernie Madoff’s Ponzi scheme or the financial crash of 2008. But they cost American corporations billions and billions in compliance every year. To comply, most firms must archive and report massive amounts of information. For some firms, the cost of compliance is also undergoing a surprise SEC audit. Even more information can be required to be gathered and reported on a deadline. Or there may even be an investigation, where the SEC determines if criminal charges will be filed against the chief compliance officer or CEO of the corporation. These investigations are a unilateral information collection process. The SEC requires some or all employees of the company to answer any and all questions. The parties being investigated do not get access to the information gathered as they do in other cases. If someone asserts their Fifth Amendment rights in an SEC inquiry, the court is allowed to infer that the answer would hurt its case. With any other corroborating evidence of a regulation violation, the court can assume the worst concerning the question you refused to answer. And yet there are still more consequences for financial professionals who take the Fifth. Many financial professionals are required to be part of self-regulatory organizations that ban those who try to take the Fifth during investigations from ever dealing in securities again. Most publicly traded companies fire employees who take the Fifth. These companies are required by SEC law to keep public corporate accounting and have no room or tolerance for secrets. And yet our government does not hold as high a standard. They allowed Lerner, as well as countless other government employees, to remain silent about their secrets regarding the scandals they were involved in. Why don’t we know what happened in the IRS scandal? Why don’t we know where the TARP bailout money went? Why don’t we have a public accounting of the Fed or the IRS? Why don’t we know what happened in Benghazi? The answer is straightforward. We don’t have a right to public accounting. If we did, things would likely be different. We would not have to protest for an audit of the Fed or the IRS. Such an audit would be our constitutional right. Some matters might be rightly judged national security, but, as is always the case for pleading the Fifth, each question would be evaluated individually. If any government official pled the Fifth on matters of public service, they would be banned from the public payroll for life. Like the financial world, there is no room for secrecy in public service. The Fifth Amendment was intended to protect individuals from the heavy hand of government interrogation. It was not supposed to protect government officials when they violate the Constitution and abuse their power. And this double standard is the reason why many are outraged by allowing this precedent to stand. Without public accountability, people are rightly suspicious that even the legitimate operations of government are corrupt. All governments are run by people, each with their own self-centered agenda. Expecting that government will act altruistically in the best interest of all without supervision is naive. We are fortunate to have some supervision and accountability in our government now, but it is by chance not by right. If we had a constitutional right to government accountability, public outrage and the media’s spotlight would not be the primary way of enforcing government compliance. All people need accountability, even those in government. Radio: Is a Government Shutdown Better Than No Government Restraint? SEC Q&A: How do I find out whether an investment adviser ever had problems with a government regulator or has a disciplinary history? GSA also blew a chunk of taxpayer money on a big conference/party, you’ll remember, but the $800,000 they spent is a drop in the bucket compared to the $4 million wasted by the IRS on its gala in Anaheim three years ago. And that $4 million is a drop in the bucket compared to the $50 million that the IRS flushed on conferences from 2010 to 2012. But the $4 million event deserves special attention, not just because the number’s so large but because, per CNN, America’s tax-enforcement branch apparently … doesn’t have all the receipts for it. Really. Watch to the end of the clip to see Cooper make a good point, too: This particular conference was held around the time they first started targeting tea partiers in the nonprofits division. While they were demanding reams of information from small groups, most of which have budgets under $25,000 a year, they were farting out millions of dollars you gave them with no serious attempt to account for how it was spent. After over six months of a lack of government investigation, Obama himself has concluded there is “not even a smidgen of corruption” at the IRS despite the recent targeting of Tea Party and conservative groups. Instead, Obama blamed Fox News and O’Reilly for hyping the story.